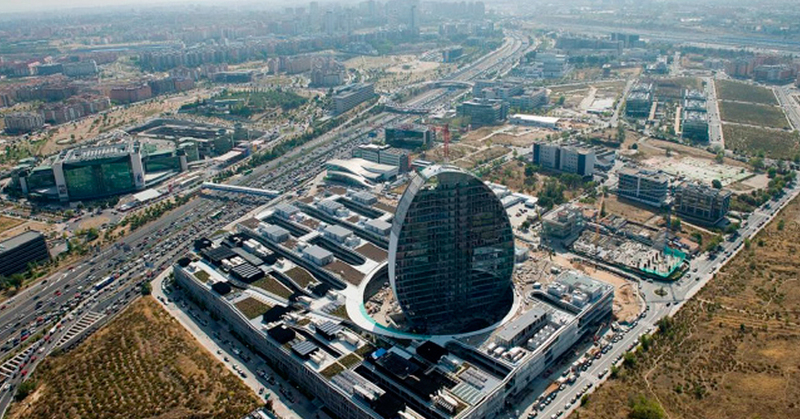 BBVA is building its new corporate headquarters in Madrid from a project of architects Herzog & De Meuron directed by Ortiz y León Arquitectos. This building with more than 250,000 m² constructed surface area is foreseen to become one of the capitals modern architecture landmarks. Its construction. has been implemented in two phases: phase I, fully operational to date, coexists with a phase II which is still being built. Phase I (one-third of the total, to the East) is characterized because two buildings once separated by a street underwent major structural changes to be adapted to a new architecture that unifies them. This large-scale structural rehabilitation resulted in specially designed solutions to solve “new structures to pre-existing” connections (metal brackets, goujon-crets, welding, etc.) and to strengthen these structures because of changes in usage or configuration (with micro-concrete counter-boring or bands of carbon fibers sticking). Phase II, on the other hand, is a completely new building, while connected with the phase I to constitute a unique ‘mini city’. The global aspect of this great architectural structure is that of seven post-tensioning concrete buildings above ground (1st floor, 2nd floor and roof) called “fingers”, up to 160 m long, with longitudinal spans usually 16.20 m and transverse unbalanced spans 10.10 and 7.20 m. These “fingers” are connected each other through footbridges (slabs hung from roof by steel braces). There are three basements below ground occupying the whole surface of both phases which are used like parking. Between this “fingers” there are open sky aisles, and flying over them there are connecting walkways. The aisles are green areas which contribute to the development of a fresh and humid microclimate inside the complex. The design not only seeks to approach working areas to a natural environment but also aims to maximize natural light everywhere in the complex. 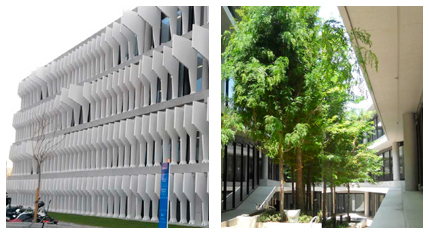 The exterior facades are covered with stylish slats preventing direct solar exposure of the working spaces. These fingers, which run South-North direction, merge in the Northwest in a single volume which houses an auditorium of elliptical floor (axes 30 and 20 m) whose base and roof are lightened post-tensioning slabs, and side closure, an almost 9 m high concrete wall.